Sleep your way to victory! Week 17 was bike week at 90ways.com. Every cyclist in the Tour de France knows the importance of a good night's sleep. That's why the Tour includes two rest days. This summer, I thought, what better way to commemorate the Tour than by sleeping my very best? And what better way to do that than by participating in sleep research? So, full of cycling fever, I joined a four-week sleep and alcohol study at the Bradley Hospital in Providence, Rhode Island. Here's the coverage. Good sleep requires a focused mind capable of consistency and dedication. So for the first two weeks of the study, the other 3 participants and I followed a strict routine at home: in bed every night between 11pm and 8am, wearing a blindfold and an activity-monitoring bracelet. No music in bed, no TV, no reading, no sleepovers. No naps during the day, either. After two solid weeks of sleep training, I was keyed up and pumped for the real thing. But questions remained. Had I prepared well enough? Were the other participants as prepared as I was? The lights would be dim. There would be no windows. There would be no sun for 11 days. On the brink of checking into the lab basement I thought to myself, "I do not intend to lose my first study." Stage 1: the alcohol protocol. This study was about the effects of alcohol on sleep patterns in young adults. There are two big ones: while alcohol is in the blood and brain, it can be fairly pleasant and a decent sedative. But the after-effects of alcohol on the brain can ruin the second half of a night's sleep by causing restlessness and insomnia. Alertness and performance, such as in a driving simulator, drop off as well -- long after the alcohol itself is gone. During our alcohol protocol, which happened six times during the study, we received "a quantity of alcohol in tonic water with a lime." Vodka tonic. All right. Each tonic contained one or three shots, adjusted by body weight. To mask the dosage, all the drinks took up three glasses of tonic water, which we drank over 10 minutes each. After drinking, we played simple video games which tested our performance abilities. One was terrible: a computer screen impatiently flashed 5-digit numbers at us and our job was to click the mouse whenever a number repeated itself. Boring and stressful, with no reward. The other game was more elegant and possible to enjoy. We held a box with a little screen and some buttons. When, at random intervals, a counter started counting milliseconds, our job was to press a button and stop the counter. Simple. And since it showed my reaction time on the counter, I found myself getting psyched up and excited whenever I went below 200ms. Faster than you. For one participant, the competition from computer games and the taste of tonic water were too fierce. After the first alcohol protocol, he checked out. Then there were three of us in the peloton, and the basement was that much roomier. Stage 2: napping and sleeping. Several times a day we took scheduled naps. Well, not really naps. They put us to bed and asked us to sleep, and watched how long it took us to drift off. But there wasn't much chance for productive napping. Kind of a joke on naps, really. Bedtime at night was always welcome. Indeed, getting solid sack time is just what we'd been practicing at home. But there was a catch, for which we couldn't prepare. Our dim, sunless days were on an altered schedule so that sometimes night was day and day was night. This was essential to the experiment, since nobody knows whether alcohol's interaction with sleep has more to do with our internal clocks or with our daily routines. For example, which is the more significant: a drink when you think it's 10pm, or a drink two hours before you fall asleep? To protect the naiveté of future participants, I can't reveal the details of our altered schedule. But I can reveal that for those 11 nights in the real world, we definitely didn't sleep 11 times. Actually, it was a hoax and we slept exactly 11 times. Just kidding, we didn't sleep anything close to 11 times. Sorry, just kidding again, we did. Well, there's only one way to find out. Stage 3: electrodes. 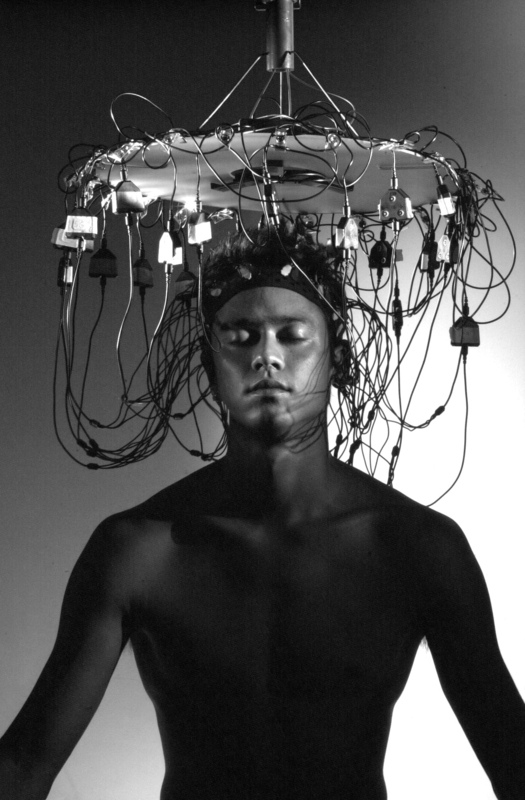 Sleep research is all about the electrodes. We wore 4 on our scalps, glued in place with nasty smelling (vanilla plus nasty?) glue called collodion, which is good for holding boxers' smashed up faces together. These electrodes picked up our brain waves, which revealed whether we were sleeping, in REM sleep, etc. We had 7 other electrodes taped to our faces which measured our eye and jaw movements, and two on our bodies to measure heart rate. All 13 had to be plugged in, leaving us with unwieldy ponytails. Stage 4: sleepy-scales and spitting. Performance tests and electrode recordings have their limits, so we also gave information about our sleep cycles by survey and by spitting. In hundreds of surveys, we answered again and again, "How sleepy are you? ", "How tense do you feel? ", "How alert do you feel? ", etc. It felt strange to check in with myself on those points many times a day. In everyday life, moods and feelings have a way of sliding by unnoticed or forgotten. All these snapshots would probably make good, surprising reading. At least in young or middle-aged adults under dim lighting, saliva samples can be used to measure body levels of the hormone melatonin. Melatonin derives from tryptophan, the amino acid in turkey that can make you sleepy. We spit into little plastic tubes hundreds of times. I won Most Improved Spitter and got to wear a polka dot jersey. Stage 5: eating. We ate 6 meals per day! Experimental control dictated that we neither lose nor gain weight during the study. Thus, our calories were counted and we were given points with which to order food from a menu. For weighing 172 pounds, I was awarded six points, which meant that I had the special privileges of ordering Healthy Choice Macaroni and Cheese and Fettuccini Alfredo with Chicken. The others had to settle for lowly manicotti and Handi-Snacks. Therefore, I won the eating stage. Stage 6: staying sane. I won't lie. Living with the same people for 11 days in a small, dim basement and being poked and prodded for science made for an intense experience. For diversions, TV and internet were out of the question because of the likelihood that a clock somewhere would contaminate our virgin, timeless brains. So, Balderdash and Scattergories came to the rescue. These games became creative and social outlets that probably made the difference between an intense, interesting experience and an experience that would have changed me. Vive Mattel! Vive Hasbro! One morning, the lab staff woke us up like always, took off our electrodes so we could shower, fed us, took our saliva, and then pretended they were about to put our electrodes back on. Just as they got started, the technician in charge said, "Okay guys, it's over. Get the heck out of here!" I had expected the end to come out of the blue like that, but why the bluff? Why pretend there's more study to come if there isn't? Would our last saliva sample have been flawed if we had known it was the last? Sometimes, science is drol like that. We emerged from dimness in time to see Lance ride down his capstone 7th Tour win. While he was riding around Les Champs Elysées, I was getting over all the world's dazzling light and color, teaching my fingers to type again, and picking collodion out of my hair. I'm still working on that. So sleeping turns out to be a lot less sensational than cycling, but the victory prize wasn't bad: €987.